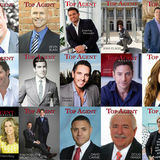 on being featured for the state WEINGARTEN of Massachusetts in Top Agent Magazine! get unexpectedly drawn down the digital rabbit hole. To save yourself time and virtual burnout, here are a few ways to unplug, recharge, and make the most of your time online and off. Focus on one digital task at a time. While multi-tasking may seem like a sound approach to productivity, this method usually results in surface-level progress across a few tasks, rather than reaching the finish line on any. Instead of opening multiple tabs and trying to do it all at once, hone in on one digital task at a time. Have emails to return? Allocate an hour to work exclusively on this to-do list item. Need to post a new blog entry? Pencil in a dedicated half hour. If you focus on one task a time and exclusively devote your energy and productivity to it for a set period, you’ll make a far bigger dent in your list of duties for the day. Mute social media notifications and create dedicated check-in times instead. Instead of taking a reactionary approach to social media—waiting for the dings and pings that lure you back to your screen—try muting some of your social media alerts and instead dedicate three timed windows per day to check-in on your timelines and engagement. If you’re constantly interrupted at unexpected intervals when someone likes a post or leaves a comment, your whole workflow can be derailed. Instead, unchain yourself from the instant gratification of responding to every buzz and beep your phone emits. Systematize your professional social media life and you’ll stay organized and on task. Keep your inbox organized. While it may take some time and effort to create a sorting system for your email inbox, it can go a long way to limiting distractions and stress. Create folders and an organizational flow and every communication will have a place and a priority. That way, when you open up your inbox and have to go digging for old emails or exchanges with past clients, you won’t have to waste time sorting or feel overwhelmed by the clutter. If everything has its place, you’ll have an unobstructed, streamlined canvass to conduct business from. Digital distractions don’t have to derail your day or sap your productivity. Email, internet, social media—all are tools to be commanded. With the right planning, understanding, and consistent execution, you’ll be able to wield the power of each without the downside of distraction. 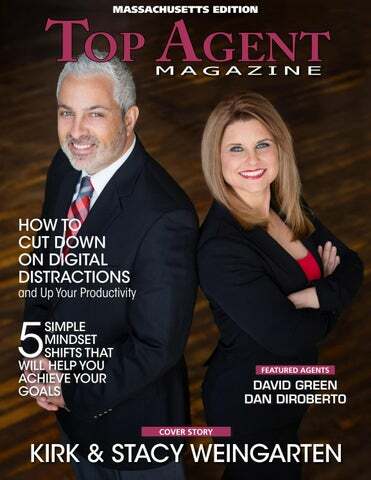 on being featured for the state of Massachusetts in Top Agent Magazine! are they doing that you aren’t? There’s probably more to their story than you’re giving them credit for. Someone else’s success doesn’t hinder your ability to do the same, but constantly having a ‘life’s not fair’ attitude definitely will. We all procrastinate to some extent. Usually it’s things we don’t want to do. But when you put something like that off, it creates a serious cloud over your whole day. Experts recommend getting those things out of the way first. Not only do get it crossed off your list, but you will feel energized by your accomplishments and tackle the day with even more force. you’re back in a rational state of mind and take it from there. It’s very easy to be thrown off by negative feedback or constructive criticism. No one likes it. But when it comes to achieving your goals, you need to be able to hear it, assess it and then make an unemotional decision about what it means to you and your success. In fact the business world’s most successful leaders are there because they not only take in that feedback, they actually constantly ask for it. Fresh perspectives on what you’re doing are always valuable. When you’re in the thick of it, it can be hard to see what needs improvement. Asking a trusted peer or advisor can be instrumental in keeping the momentum on reaching your goal going. You might be wondering what the difference between the two are. A fixed mindset thinks that growing intelligence or skills is impossible, while a growth mindset thinks those things can be developed. People with a growth mindset are more likely to expand beyond their comfort zone, since they really believe almost anything is possible with hard work. And if it isn’t? They’re willing to give it a try. Being willing to try and fail, is a key element to reaching even the most lofty goals. To learn more about Kirk & Stacy Weingarten email Kirk@RovithisRealty.com or Stacy@RovithisRealty.com, call Kirk at (413) 244 – 4107 or Stacy at (413) 244 – 7634, or visit KirkandStacy.com www. DAN DIROBERTO Dan DiRoberto began his career in real estate more than a decade ago. Inspired by the opportunities in his hometown, he launched a rental agency and earned his license alongside his late brother. As the market evolved and opportunities in the area continued to flourish, Dan and his brother expanded their offerings to begin The DiRoberto Team. Today, Dan and his colleagues have cemented themselves as veritable industry experts specializing in rentals, property management, and residential sales. What’s more, Dan has cultivated a reputation for straightforward communication, industry insight, and service that goes above and beyond. When it comes to marketing, Dan and his team leave no detail unaccounted for and blend the best practices of both digital and traditional methods. In addition to high-quality photography and exposure across the leading online listing and rental platforms, Dan also leverages mailers, billboards, and magazine ad placements to secure wide-ranging visibility. Of course, his well-cultivated database of business often pairs buyers and sellers in short order, as Dan puts in the legwork to connect clients with their ideal criteria. Furthermore, Worcester County is continuing to grow as new enterprises join the community, like the recent addition of the Boston Red Sox Farm League. With the market for investment properties and rentals booming, Dan and his team bring an unmatched level of experience and service to the local property management and resale scene. Serving Massachusetts’ Worcester County, Dan heads a team that includes four additional agents and an administrative assistant. Together, they serve clients under the banner of RE/MAX Advantage 1 and have built a sizable contingent of repeat and referral business—amounting to more than 90% of their client share. In describing his own working style, Dan cites a forthright attitude, personalized client care, and aggressive marketing techniques as the primary drivers of his steady success thus far. “We pride ourselves on our work with clients,” Dan says. “We earn great feedback and we always make sure to go above and beyond, because we plan on being in this business a long time—that’s how you stick around.” What’s more, Dan’s services run the gamut and account for a variety of real estate needs, including specialized work with investor clientele, property management services, and residential resales. Because he works with clients at all phases of the rental and homeownership process, he has been able to curate a substantial database of prospective buyers and sellers—an invaluable network from which to draw. Likewise, he is often able to broker off-market deals that serve as win-win scenarios for buyer and seller alike. To learn more about Dan DiRoberto, email DannyDiRoberto@gmail.com, call (508) 579 – 8983, or visit WorcesterSalesandRentals.com www.